The end of back pain and unpleasant smears: Leifheit Profi micro duo removes with its special 2-fibre wiper cover even persistent dirt and can comfortably be operated by foot. This is the way the ideal floor wiper for large areas like kitchens or office rooms looks like. The 2-fibre wiper cover is made of the proven Leifheit micro fibre Duo. Numbers of finest bristles, which stick out a little bit, reach the smallest hollows and remove even persistent dirt without effort. 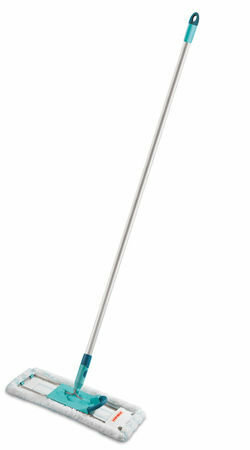 With its imposing wiping width of 42 cm the Profi micro duo saves many working steps and valuable time. The ingenious flexible 360° rotating joint enables the efficient cleaning in wavy lines and revolves around table- and armoire-legs. The handle can completely be bent flat for even hard to reach areas like those under armoires and beds. The floor wiper can comfortably be operated while standing: simply remove the wiper cover by a foot click, press it in the separately available Leifheit Mop press, insert it again, ready.